Hundreds of locals got cozy on lawn chairs, blankets and pillows for the Everything Is Festival kickoff graveyard slumber party over the weekend. No, not because they're weird. It was for Cinespia and The Cinefamily's all-night "Summer Camp" movie marathon kickoff party for the Everything Is Festival on Saturday in the Hollywood Forever Cemetery where guests were invited to spend the night on the lawn as they screened Wet Hot American Summer, Sleepaway Camp, and Little Darlings, and featured DJ sets from Carlos Niño, Peanut Butter Wolf, Cut Chemist and more. 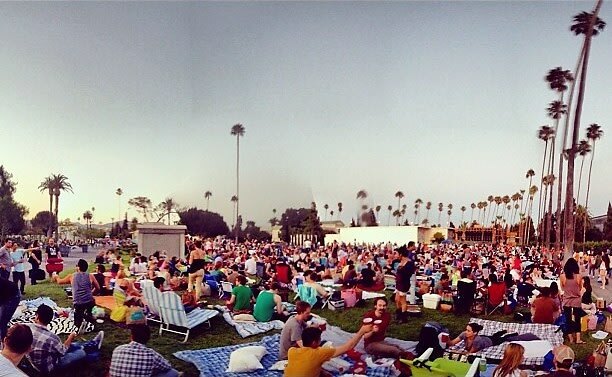 No word yet on whether George Harrison, Johnny Ramone or Bugsy Siegel's ghosts rose from their nearby resting places to join in on the fun but maybe they'll be down for one of these other upcoming Cinespia Cemetery Screenings.